Last Wednesday, Mary Anne Hobbs, ex-BBC Radio 1 DJ and Ted speaker, came to Los Angeles as a guest DJ. She was on the billing at Low End Theory, the bass-driven, dub-step loving, low-tempo club that has sparked a worldwide revival in head-nodding! Residents of Low End Theory read like a who's who of the scene: Daddy Kev, The Gaslamp Killer, Nobody, D-Styles and MC Nocando. Read more about the club (affectionately named after the seminal Tribe Called Quest album of the same name) at the LA Times. LOW END THEORY Video for Qetic from Qetic Channel on Vimeo. Roadblock and U-turn Little did I know that arriving 45 mins after the doors opened was a sure way to wait in line behind 100 clubgoers! And the club doesn't look that big! Should I have known? Well, school is out, Mary Anne Hobbs is a fave of this scene and may be EPROM, the other headliner, is big too. What I do know is that I didn't wait in line. Instead I returned home and downloaded the podcasts to enjoy in the comfort of my "yard." Moral of the story You can't sleep when you're trying to outpace 100 tweeting youngsters. Get connected! ;) And check out those podcasts...there are 20+ of them, including Mary Anne Hobbs. Low End Theory radio: Check out this Last FM radio channel dedicated to the resident DJs and various artists who have featured at Low End Theory over the years. On plain sight, this graffiti mural of a young man facing the wall looks innocent enough. 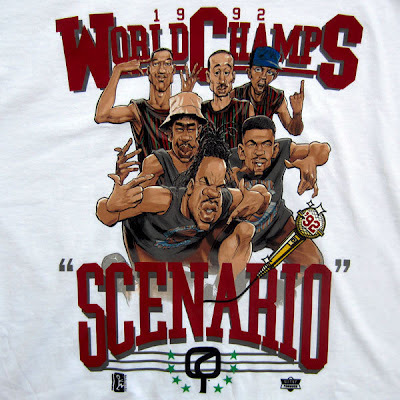 At best, it could be a series of characters that might pop up across cities begging the question "what does it mean?" 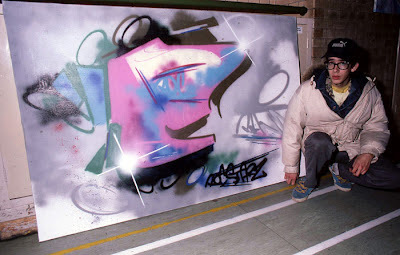 This Choe graffiti tribute is for another victim who may not get such a public outpouring. A Chinese foreign student teen from the Chicago suburb of Bridgport who was beaten by a gang of teens and then robbed of his wallet and shoes - which were used to beat him. Luckily, he escaped by running through the snow, nearly barefoot. 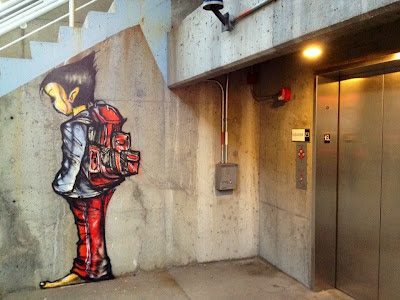 See Choe's mural featuring the kid's barefeet! And now back to the studio This CBS2 News report below shows some of the cowardly acts. Here's some propoganda for you: CBS2 News reported, "...police say it was not a racially motivated crime, but in retaliation for a fight a few months back..." Oh really?! This is the three-minute video that inspired Choe to paint his tribute. It's disturbing. And this is the latest report on the arrest and charging of seven teens, including a girl?! When I first arrived in Los Angeles I noticed some graffiti crew affiliations clearly marked in the graffiti stronghold of Melrose Avenue alleys. They would read "CBS," "Seventh Letter"...but I didn't realize how many of my favorite artists were down with West Coast Artists, aka WCA...Cartoon, Cre8, Make, Mear, Kofie, Retna. Once exception is Risk. 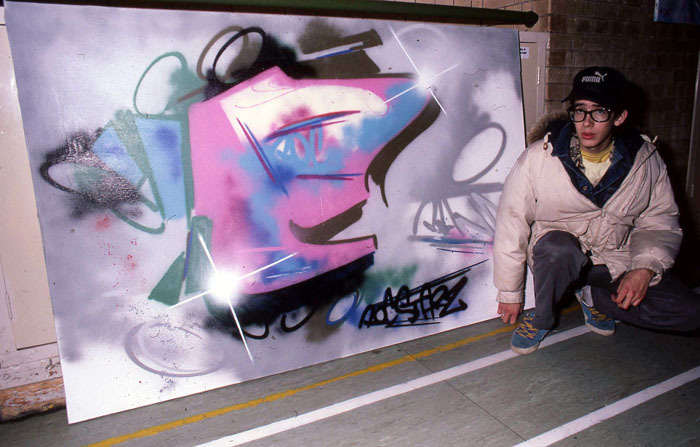 At his Robert Bergman show in 2008 he dedicated one whole wall to his history with West Coast Artists crew, including the world graffiti championship trophy won in Bridlington, England in 1989! If you ever see Inkie from the UK - go ask him about that battle. Last Saturday's group show at The Mirror Films Gallery showed how strong the crew's ties are. Read this LA Weekly blog for a short, but interesting read up on the crew and the show. For great info on the artists featured in the show check out Mirror's store. You can also see if anyone has bid for your favorite pieces...$10,000 for a Risk mixed media installation, anyone? West Coast Artists group show runs until July 10th, 2012. 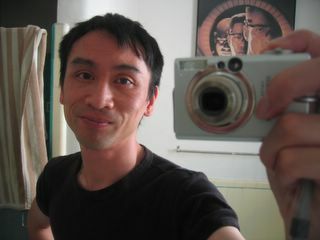 Mirror Gallery, 963 Chung King Road, Chinatown. After the BritWeek art event in LA in May, Inkie went on to visit San Francisco and New York to paint some wildstyle! Check out these pictures from his Facebook page...awesome! 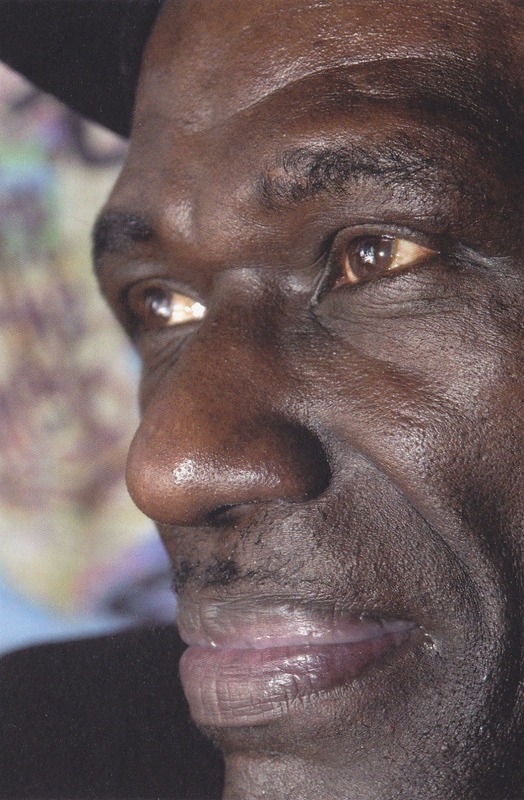 The sad news of old skool writer, Stay High 149, passing away hit the Interweb this week. I met him once and still remember his energy. Now, the New York City metro map he tagged with a smoking Saintly figure will be a poignant reminder of his Los Angeles visit in 2005. As Patti Astor said "A leader in the game. 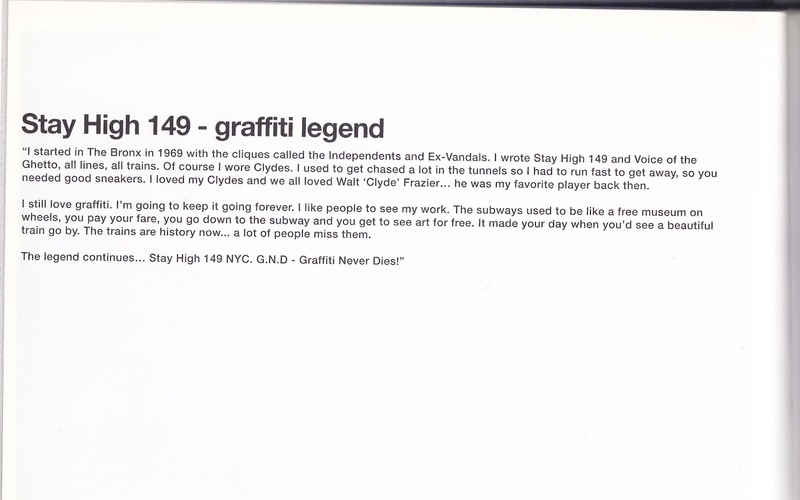 I'm glad he got a chance to get his book out, no one will forget Stay High." You can check his book out on Ginko Press here. 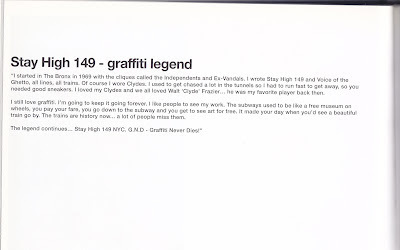 This video is an amazing lesson in graffiti history...this is why we're mourning Stay High 149! 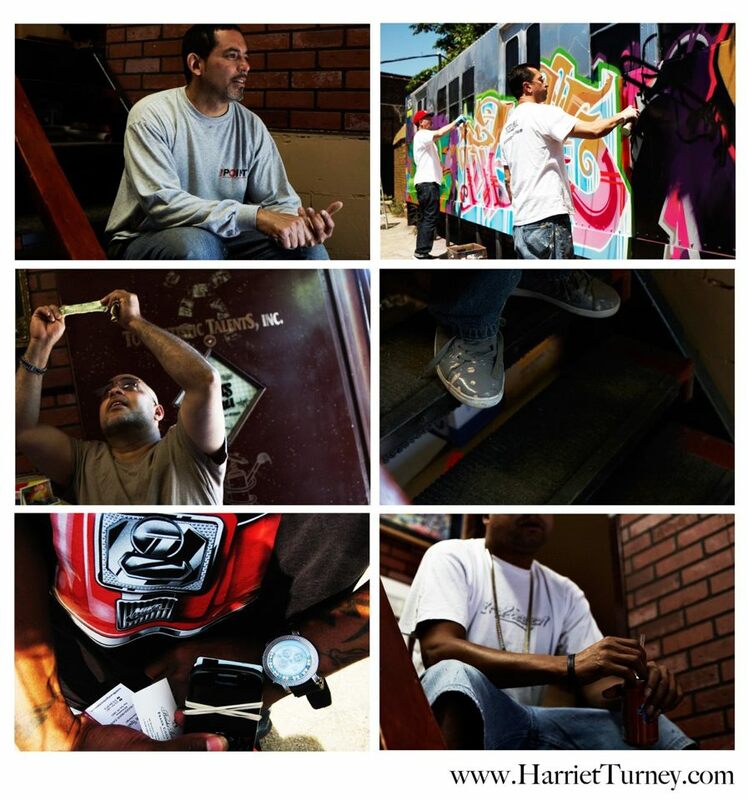 It took place last month, but it's still worth sharing these images of the painting action between LA and UK graffiti artists. The "paint off" in downtown LA's at the Continental Gallery was part of the on-going British culture push to raise awareness of the Olympic Games this summer in London (and the recent HRH The Queen's Diamond Jubilee.) But what was special was this was PR event were the artists taking part: in the red corner was LA's Mear One and Man One (of Crewest Gallery) were painting live; and in the blue corner were UK's Eine (the man with the store shutter lettering and "Art in the Streets" credit) and man about town, Inkie, flexing their skills. Eine (UK) paints a version of his "Worth More Than a Scion"